The Baleno is Maruti’s all-new premium hatchback. Name apart, it has nothing in common with Maruti’s mid-size sedan from a decade ago. What this is, is a hatchback that’s half a size larger than the Swift and one that’s correspondingly, a more direct competitor for the Hyundai i20 and Honda Jazz. At 3995mm long and 1745mm wide, the Baleno is a large car. But it’s not solely the size that will get your attention. The design and styling is the best we’ve seen from Maruti in a long time. There are a lot of new elements like the V-shaped grille, still distinctively Suzuki, but yet refreshingly new. Then there are the headlights, similar in shape to the ones on the Swift, but smaller and with a lot more detailing inside; our top-spec test car had projector elements and daytime-running lights. Move over to the side and you’ll notice more than a few interesting bits. The wing-mirrors, for one, are mounted on the door rather than the pillar and this detail helps link the Baleno to the S-Cross. It also helps cut wind noise. You won’t miss the rich-looking, chrome-finished door handles and the large glass area which is quite distinctive with the neat quarter window. What adds more flavour to the design is the interplay between the rising window line and the rake of the rear windscreen – it makes the Baleno look pretty sporty. The tail is also rather well styled with nice looking lights and a chrome bar. No doubt, the Baleno is the best looking Suzuki hatchback yet but it’s still a touch conservative compared to its rivals. On the inside, you do feel like you’re sitting in a Maruti, albeit a very modern one. Yes, we’ve seen bits like the steering wheel,the control stalks and buttons from other Marutis whilst the power window switches continue to be carried over from the first-gen Swift. Only Suzuki can make such good paisa vasool of its parts bin. This also tells you that like all Suzukis, the Baleno too is built to a cost, which is evident in the quality of some of the materials. The plastics, especially on the door pads, don’t feel particularly upmarket, the seat fabric isn’t very premium either and the all-black interior feels a bit gloomy too. But, whatever Suzuki may have saved by using some low-cost materials, it has more than compensated with a great driver interface, especially on the top-spec Alpha version. Let’s start with the blue-lit instrument panel, which really stands out like an island in a sea of black. The dials with ‘chaplets’ look rich but it’s the 4.2-inch TFT display in the centre that is packed with a multitude of functions. You get a trip computer which calculates average speed, range and real-time and average fuel consumption and a unique power and torque meter. The last bit is a bit gimmicky but enthusiasts can entertain themselves by seeing how the Baleno delivers its grunt. The centre piece (literally) is the 7-inch touchscreen which sits nice and high in the V-shaped centre console for better line of sight. It’s essentially the same unit as in the S-Cross and Ciaz so what you get is a high contrast display with sharp and very legible fonts. But the big news is the introduction of Apple CarPlay which is a first in the segment. You get the same interface as your iPhone gets paired instantaneously with the car’s touchscreen with a USB cable. The ease of use and familiarity of the system, because it mirrors your phone, makes CarPlay instantly addictive. You won’t want to use anything else. Before Android users start jumping up and down in protest, Maruti is planning to introduce Android Auto in the car as well in the near future. Practicality is one area where the Baleno scores brilliantly. Suzuki has made full use of the long 2520mm wheelbase to give a genuinely large cabin that can rival the best in class for passenger space, comfort and storage space (lot of large bins and bottle holders). In fact, rear seat space is one of the highlights and apart from a relative shortage of headroom, passengers won’t have much to complain about. There’s a generous amount of legroom and the cabin is wide enough to seat three abreast too. However, the flat contours don’t hold passengers snug who are likely to be tossed around during spirited driving. The front seats are pretty large too with generous thigh support and foam density that is a touch on the soft side. What you get is nice, springy cushioning and a pair of front seats that are amongst the most comfortable in any hatch. There’s been no stinting on boot space either but it's not only the 339litre capacity that’s impressive but the intelligent way the boot has been designed to hold large pieces of luggage, without having to flip the 60:40 split-folding seats (on the Delta version upwards) forward. Unfortunately, the loading lip is both higher and narrower than we’d have liked. Internationally, the Baleno will be sold with a 1.0-litre turbo-petrol engine. Sadly, India won’t get that engine, at least for now. Instead, the Baleno will be offered with Suzuki’s 1.2-litre K12 engine and the Fiat-sourced 1.3 DDiS diesel. Both engines come mated to five-speed gearboxes though the petrol car can additionally be had in an automatic variant with a CVT. The diesel Baleno gets the lower powered version of the ubiquitous 1.3 DDiS motor now badged DDiS 190. It’s essentially the same 75bhp unit that powers the Swift but in slightly different state of tune and being a 100kg lighter, the diesel Baleno feels more sprightly too. There is still a fair amount of turbo-lag below 2,000rpm but the overall power delivery is more linear now. On part throttle or for normal city driving, the Baleno is fairly responsive and, thanks to the light weight, is quicker than the more powerful Hyundai i20 diesel. It’s only when you floor it at low revs for a quick overtake that the engine gets bogged down. The engine is fairly free revving for a diesel and easily goes past 5,000rpm but beyond 3,000rpm, the engine is quite noisy and it’s best to upshift early. The engine is quite noisy and refinement of the Fiat-sourced engine, which is now clearly showing its age, is poor by today’s class standards. The bright spot though is the exceptional fuel economy Maruti claims to have wrung out of it – 27.39kpl. Suzuki’s in-house petrol 1.2-litre K12 motor, which powers a wide range of models, is an absolute jewel that sparkles even more in the lightweight Baleno. Again, the 100kg weight saving has given it an eagerness that was missing in the Swift. The lower weight and short first and second gear ratios mask the K12’s inherent weak bottom-end and flat mid-range. As a result, the manual petrol Baleno is quick off the line and on part throttle, scoots through gaps fairly well. There’s a bit of a gap between second and third gear which has relatively tall ratio and this necessitates more frequent downshifts from the third to second, to stay in the meat of the engine’s powerband. What’s truly impressive about this motor is how smooth and refined it is. There’s no hint of harshness even when you rev it to its rather conservative 6,200rpm limit. The gearshift too is slick and allied to a light clutch, you may not feel the need to go in for an automatic. But if you do, there’s a CVT automatic option available only on the petrol and the good news is that it doesn’t come at the expense of fuel economy. According to the official figures both the manual and automatic petrols give an identical 21.4kpl, which again, is best in class. At low speeds, the CVT is incredibly responsive. 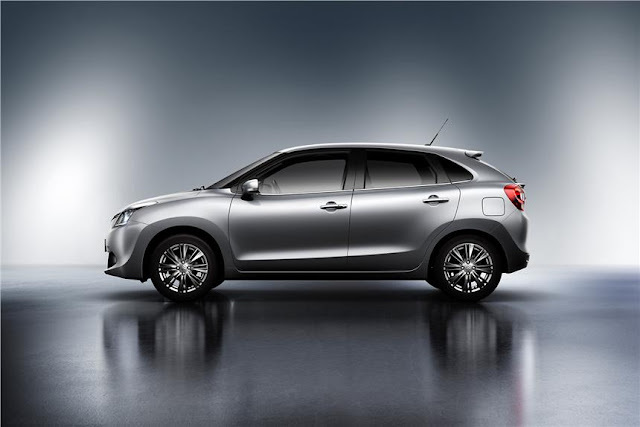 Just tap the throttle and the Baleno shoots forward with the immediacy of a manual. However, go past 4,000rpm and the CVT’s ‘rubber band’ effect comes into play. The revs shoot up without a corresponding increase in speed which make the engine sound constantly strained. Put your foot down and the engine spins to 6,000 rpm and stays there whilst the Baleno slowly gathers speed. The CVT is clearly not a highway chomper and is best left within city limits where it excels as an effortless commuter. It’s a real shame then that the CVT option only comes in the mid-level Delta spec. Maruti’s logic not to offer it in the top Alpha trim is that it would then get too expensive. But shouldn’t the customer be the one who decides? 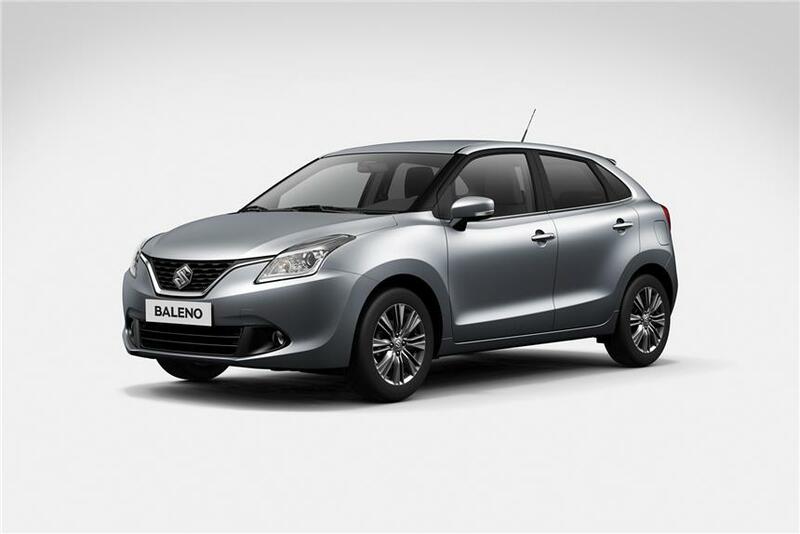 The Baleno’s mature ride and handling came as quite a surprise. We expected a car with such a low kerb weight to feel a bit skittish over bad roads but instead, the Baleno rides with the authority of a bigger, heftier car. Straightline stability is superb, no doubt aided by the long wheelbase, but it’s the finely balanced suspension (biased to the softer side) that gives the Baleno its dynamic prowess. The ride is quite absorbent and except for sharp edges (more noticeable in the top-spec variant with 16-inch wheels and lower profile tyres), the suspension despatches bumps and bad roads with a muted thud. The suspension too works quietly with no loud thuds, which complements the excellent ride comfort. but, there’s a nice heft to the steering which gives the driver immense confidence at any speed. A 170mm ground clearance (20mm more than the European model) takes care of speedbreakers and sharp verges without a worry. Maruti has thrown a lot into the Baleno, the company’s first serious shot at the premium hatchback segment. It certainly looks the part with its stylish looks and well-planted stance. It drives well too thanks to a lightweight body which translates to a good power to weight ratio and hence, performance. A superbly judged suspension and overall refinement gives it the feel of a bigger, plusher car. The cabin too comes as a surprise with its practicality and spaciousness to once and for all axe the perception that Suzukis are small and cramped. However, Suzukl’s cost cutting ways are still all too evident in a cabin that could have been more plush and better detailed. However, Maruti has more than made amends with some truly unique features that will surely have its competitors scampering to offer similar stuff. That all the variants of the Baleno come with two airbags, ABS and EBS as standard shows the company’s new-found commitment to safety. The question is will customers be willing to pay for it? That leads us to the Baleno’s price. It won’t be bargain basement with all the kit inside for sure but at an estimated price of Rs 5.7-8.3 lakh when it goes on sale on October 26, through the new Nexa network, it’s still good value, like every Maruti.